UPDATED: Thu., June 19, 2014, 10:55 a.m. Residents of Eastern Washington expressed concern and skepticism Tuesday to state lawmakers working on a bill that would regulate an expected boom in trains carrying crude oil across the state. 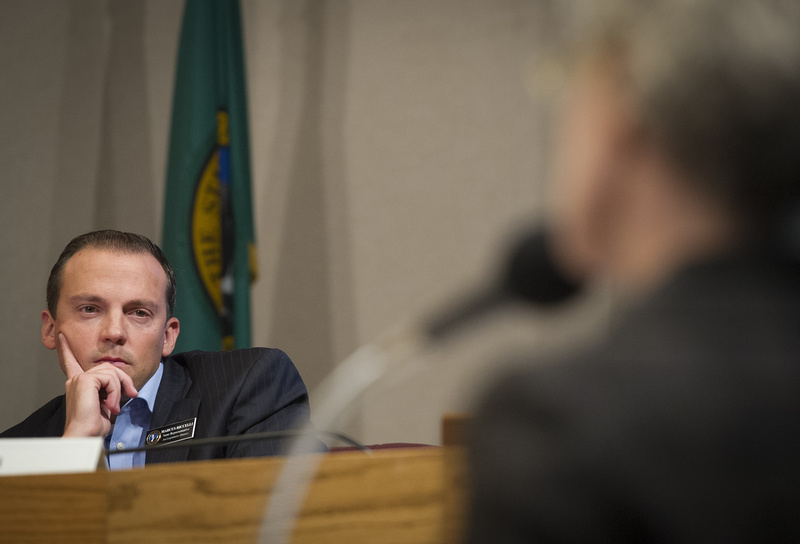 Members of the state Senate Committee on Energy, Environment and Telecommunications heard from industry sources and members of the public on the safety of transporting oil from North Dakota’s Bakken fields to refineries in Western Washington and Oregon. The focus of the session at Spokane City Hall was legislation co-sponsored by state Sen. Michael Baumgartner, R-Spokane, that would require companies to disclose the amount and type of crude oil they’re shipping. The “Spill Prevention and Response Act” also would levy a 5-cent-per-barrel “oil spill response tax” to fund training for first responders. The committee heard from representatives from the North Dakota Petroleum Council on the composition and explosiveness of Bakken oil as well as BNSF on the company’s safety investments and policies. Patrick Brady of BNSF told the committee the company was working to prevent derailments and spills through advanced computer monitoring. The company is spending $5 billion this year on infrastructure projects, $235 million of which is going to Washington, a BNSF official testified. While federal regulators are still developing standards to retrofit or upgrade aging rail cars, the industry is moving to replace older models, Brady said. He estimated 40 percent of trains carrying Bakken crude have not been upgraded to the new model. Kari Cutting, vice president of the petroleum group, testified that oil from Bakken regions is “not materially different” and is just as safe to be transported as any other type of crude oil. However, she said, the new cars could still be ruptured. Critics of the bill said it didn’t go far enough to ensure companies are providing information to first responders, local authorities and government agencies. Some speakers from the public named several major derailment accidents, including in Quebec and Virginia. While the committee had promised an hour would be allotted for public comment, it allowed expert testimony to run long and limited the public discussion to about 15 minutes. “Expanding the barrel tax is good, but the bulk of the funding goes to responding instead of prevention, and we need to be focused on prevention,” Stuckart said. This story has been changed from its original version. The amount BNSF is spending on projects in Washington was incorrectly reported as $125 million. Published: June 18, 2014, midnight Updated: June 19, 2014, 10:55 a.m.